Tonight on Darkeness Radio, Coast-to-Coast guest host Dave Shrader will interview Bigfoot novelist Kirk Sigurdson. Dave Shrader is also the Executive Producer of Darkness on the Edge of Town, a Paranormal Radio show that has been broadcasting since 2006. Tonight Kirk promises to take us down the rabbit hole into a world that is probably more real than the one we perceive. On his website KultusBook.com he writes, "I will be speaking about my experiences with the supernatural, which also include a plethora of sasquatch encounters over the course of a lifetime, particularly my most dramatic sighting that occurred at Spirit Mountain, Oregon, in 2009." It's interesting to note that Spirit Mountain is known for all sorts of intra-dimensional phenomenon, including UFO's, orbs (especially mini orbs that seem to function as monitoring probes of sorts), and intra-dimensional portals. The area actually has a great deal in common with the Skookum Meadow area in Southwestern Washington. Thirteen years ago, I began squatching in earnest between Lone Butte and Squaw Butte (on each side of Skookum Meadow). 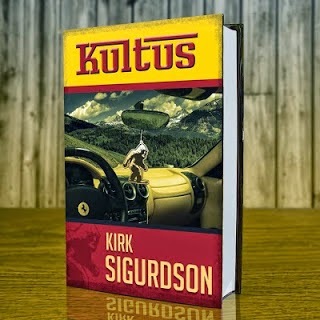 This was the time that I was conducting a great deal of research for my novel, Kultus. Check out Kirk tonight 7pm-9pm PST. At 7pm PST you can listen live here. Click the following link to go to the official Darkness Radio Website. If you have not spent a day checking out the interactive AKA Bigfoot World Map you have been missing out. I created it and I still get lost in it. You can explore, click and drag the map above or go to the full screen version at AKA Bigfoot World Map. Today we add the Comecogollos, the Puerto Rican Bigfoot. Nick Redfern offers the most on this cryptid. In an article aptly named Profiling Puerto Rico’s Bigfoot, Mr. Redfern writes, "That I was on Puerto Rico looking for the infamous Goat-Sucker, but ended up on the receiving end of a varied body of Bigfoot-themed material was a welcome and refreshing diversion." Nick Redfern continues, "Regardless of what the Puerto Rican Bigfoot is (or is not! ), when there is even a small body of material the onus is still on us, the researchers and the investigators, to study the mystery carefully and as thoroughly as possible. I cannot say for sure that Bigfoot (or something like it) really does lurk in the denser and wilder parts of Puerto Rico, but I can say – having sat and chatted with Peter for the best part of a day - that the witnesses most certainly believe that to be the case." In a reaction to Mr. Redfern's article, Cullan Hudson on his self-named blog posted an alleged photo of the Comecogollos. One investigator presented the image above as photographic evidence of this strange beast. I have juxtaposed it against another image that will better elucidate my concerns over the authenticity of this Comecogollos photo. 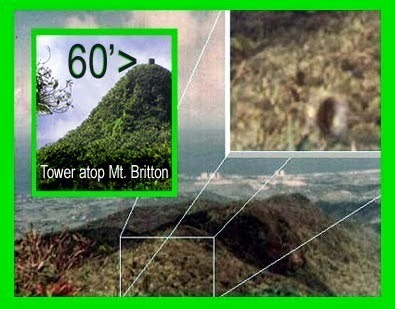 The image above of the "creature" standing higher than the surrounding vegetation in the El Yunque National Rainforest is at odds with the dimensions described by witnesses. For this image to be true, this creature would have to stand between 40 and 60 feet tall, as can be seen when we use the tower image [left inset above] for scale reference. This tower stands approximately 60 feet high. So, it gives us a good scale for the average height of the surrounding (and quite ubiquitous) vegetation. The same trees you see by the tower, are the same you'll see on the mountain in the Comecogollos image. In fact, I dare say the Comecogollos image was probably shot from the vantage point of this tower since landmarks visible from it are clearly in frame here as well. An elaborate crises simulation, used to train journalism students at Utah State University included bombs, terror and Bigfoot. A simulated Bigfoot news article was distributed to a team of journalism students to see if it would be dropped as bigger simulated news happened. While most of the crisis situation centered around an unexpected bombing at a public event, the day started with a report of a Bigfoot being captured. You can read the simulated report below. Logan Animal Control caught Sasquatch in Logan Canyon earlier today. Utah State University student Brad Larsen said he was taking a walk in the mountains when he saw Bigfoot, which he described as a “6-foot-5 hairy beast.” He shot a video and posted it online, and also notified the police. Sean Davis from Animal Control said they arrived on the scene and tranquilized the animal after a struggle. Davis said Bigfoot is being transported to Hogle Zoo for more testing and public viewing. We used Bigfoot as a red herring, of sorts. The script called for a sighting — and then later a reported capture. A video was sent to several news teams along with offers of interviews with spotters and capturers. Against the totality of the "news" thrown at the students throughout the day, the expectation was that many would bite early and then back away from that story as the day wore on and bigger news prevailed, and that's indeed what happened. You can read the original article, "Bombs, blood and Bigfoot" that tipped us off to this event, but it is scant on how Bigfoot was incorporated, despite using Bigfoot in the headline. You can also read the simulated Bigfoot news article that was distributed to the students here.